The "Superman" army doctor who took care of 12 boys and their soccer coach while they were trapped in a Thai cave shared a glimpse of their emotional reunion in the hospital Monday. Interested in Thailand Cave Rescue? Dr. Pak Loharnshoon of the Royal Thai Army -- who stayed with the boys in the cave as authorities devised a plan to get them out and was dubbed "Superman" -- visited the group inside the Chiangrai Prachanukroh Hospital in Chiang Rai, Thailand. In photos posted to Loharnshoon's Facebook page, he is shown giving each of the boys a big hug and rallying the "Wild Boars" team members in a huddle. In the same Facebook post, the doctor wro te about how impressed he was with the "determination" and "optimism" of the whole team, even in a "crisis situation." The 12 boys and their coach have been recovering in the hospital since early last week, when they were rescued from a cave in northern Thailand after surviving without food for more than nine days. Hundreds of people, including expert divers from around the world, mounted a daring rescue to save the boys and their coach from the flooded cave complex. 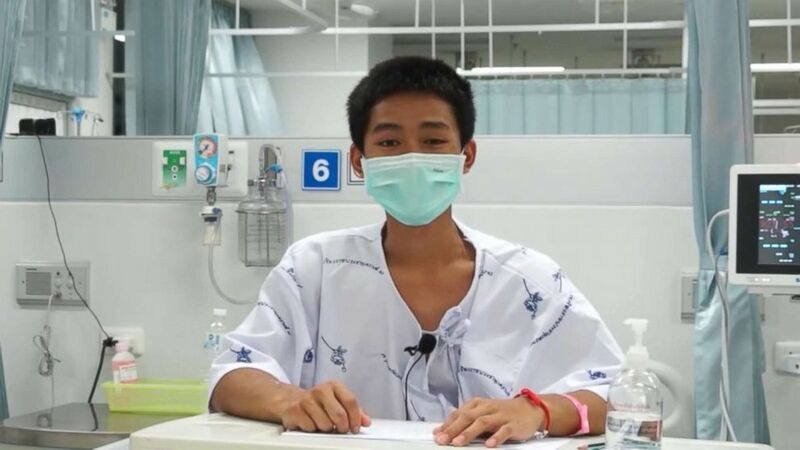 Adul Sam-on, 14, appears in a video message from a hospital in Chiang Rai, Thailand, July 13, 2018. In his post, Loharnshoon also recounted how the boys had dug a hole -- as deep as 16 feet -- to try to crawl to safety. He also commended their coach, calling him a martyr, and said that overall, the health of the group was much better than he had expected. British divers who helped bring them out of the cave, one by one, described the conditions as some of the worst they had ever seen, with zero visibility in the murky water. In images released by Thai health officials on Sunday, the team was seen writing messages on a poster featuring the portrait of the former Thai Royal Navy SEAL who died while assisting in the rescue. In the photos, some of the boys were seen wiping away tears with their hospital gowns. Thailand's Ministry of Public Health said the entire group would be allowed to go home tentatively on Thursday and that they would continue to receive care locally.